100 gm. rice, medium grain rice (Basmati rice is good for this recipe although others like can be used). This is roughly 1/2 a cup or 1 rice cooker cup. *Ready sliced pistachios and almonds can be used. Clean and wash and soak rice for 1/2-1 hour. 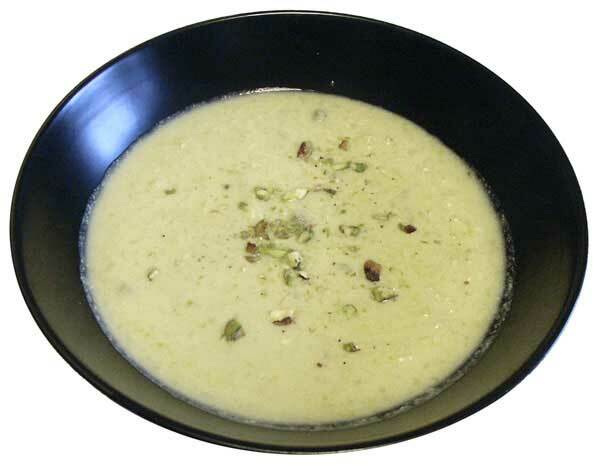 Soak almonds and pistachios in hot water for 1/2 hour. This will loosen the skins. You can do this quickly by microwaving them on full for 2 minutes. Peel skins off, it just slides off. Chop/slice almonds and pistachios either by hand or in a nut chopper. Thin slivers look better than chopped nuts. Easy way to make slivers is to use a garlic slicer, which has been washed well in hot water to remove all smell. I keep one for slicing nuts only and never use it for garlic. Heat ghee in a heavy bottomed pan and fry rice for 5 minutes. Add milk and bring to boil. 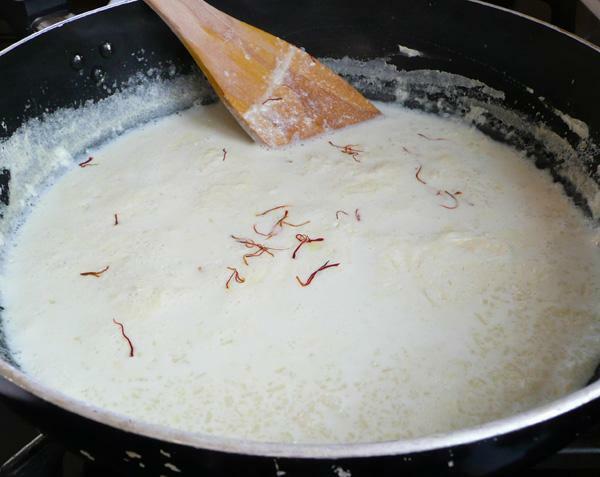 Turn heat down and cook until rice is well cooked and the pudding has reached correct consistency, like a thick custard. Add sugar, cardamoms and saffron or rose essence/ kewra essence and stir thoroughly. Add nuts & sultanas, saving a few for garnish. Place in a serving dish and garnish with a few chopped nuts. 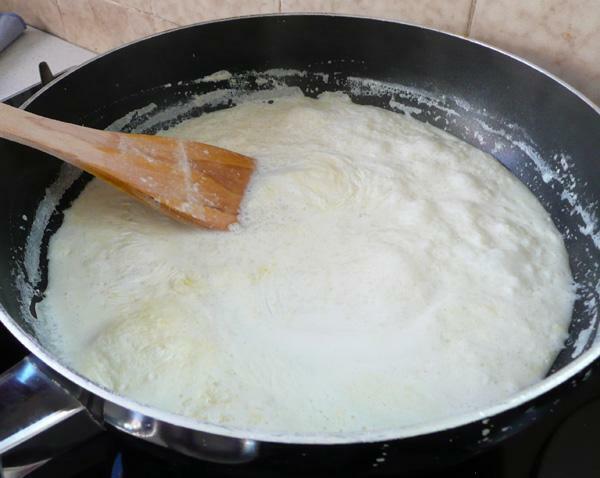 Quick Version: Place washed rice and milk in a pressure cooker and cook under pressure for 5 minutes. Once the pressure has built up, it is a good idea to turn the heat down to low. Otherwise, milk can escape through the steam vent and splash all over you cooker. Allow the pressure cooker to cool. Open and check that the rice is well cooked and mixed well with the milk. Add sugar, cardamom powder, nuts and sultanas, as per you taste. Serve hot or chilled.